Discussion in 'Alternate History Maps and Graphics' started by B_Munro, Dec 8, 2011. This is one of our stranger artifacts, purchased from a merchant near one of the Great Hubs. It depicts a Europe which has been colonized. According to what the merchant told our agent, in this world, the Mongol Hordes successfully invaded Western Europe, but their weakened forces were repelled by the Song Dynasty, which kept China fractured for centuries. The merchants referred to the Mongols and their dynasty in northern China as "Saracens," indicating that the Mongols have converted to Islam en masse. This would certainly account for the continued division of China, even after the fall of the Mongol Empire. It appears that more than one Chinese state has arisen from southern China, judging by the separate Chinese states holding dominion in eastern and western France. As for Europe, the merchant made a point about the destruction of Rome and the "thousand years of darkness" that followed Mongol rule. After the Mongols, the Chinese "fled the Middle Kingdom by the sea, and found new lands." It is unlikely that these are what we consider the Americas, it is likely the archipelagos in Southeast Asia. This is likely where the Chinese received their knowledge of seafaring. The merchant did refer to the colonies in Europe as "new," and indicated that the Japanese have dominated the Americas, akin to the Spanish of our timeline. The Japanese do have some colonies in Europe, particularly Ireland and Valencia, but these may have been taken past the height of the Japanese Empire. It is interesting to note that this world is also home to a thalassocracy centered in Luzon, where the merchant says this map came from. They have possession of northwestern Spain, the Balearics, and Sardinia. These two seem to have been eclipsed by the Chinese state, particularly the "Nanking Empire" the merchant mentioned. Apart from the Asian colonies, there is a Mongol Empire which has taken the place of our world's Russia, a "Roman Khanate" centered in Anatolia, a "Norse Kingdom," and what the merchant referred to as the "Allemanian Khanate." While it is clear that this is the German state in the center of Europe, it is unclear if it is a descendant of the Holy Roman Empire or is another German state entirely. There are a few independent European states in the West, likely buffer states maintained by the Asian powers, and an independent Hungary. Then there is the "English Empire," which is evidently a militaristic aggressor towards its neighbors, Asian and European. Given the sheer distances involved, it is unlikely that the Asians have colonized these areas of Europe thoroughly. Based on typographic comparison, there is no difference between the nomenclature of independent states and some of the European states. A system of protectorates and nominal sovereignty, akin to the princely states in our own British India, may be at play here. CarlAlbertForPresident, Viralworld and Wendell like this. There have been many scholarly debates concerning the downfall of Europe and the dramatic shrinking of their influence in the worldy affairs. Unfortunately, the events and circumstances leading to the current state are still a matter of heated discussion, not least because the native sources, authored by Men of Church who also wrote fantastic stories of demonic apparitions and men performing miracles, are now considered dubious at best. However, what everyone universally agrees on are the details about their cause. It is not surprising to note that the beggining of Europe's end is incidental with the destruction of the Roman Empire. As people tried to put a stop to this period of turmoil, Emperors sought to make quick peace with the first wave of barbarian chiefs that came to their territories. Often such deliberations were hasty and haphazard, as was the decision of Honorius of not just officially recognizing the independence of Visigothic settlements, but also accepting to treat their king on equal terms as "eternal allies", probably impressed by their military prowess. This official blessing of the Emperor helped them distinguish themselves from the other barbarias, as they were no longer seen as enemies and invaders, and gave them the golden opportunity to expand their territory with impunity with the vested purpose of "protecting" the Roman people in the recesses of the Empire from further assaults. The subsequent kings were shrewd enough to gain the favor of the Church as well, granting them further protection. In 425, Theodoric baptized in the basilica of Toulouse, making him the "defender of Christian faith" with the approval of a Pope growingly trubled by the birth of new heresies. Unfortunately, the later developments proved the Visigoths unable to live up to the expectations that Romans trusted upon them. The first series battles on the river Seine against the hostile Franks proved exhausting enough for both parties even with the help of entrenched Roman troops in Gaul, and ended with the stipulation of a truce that marked the river Loire as a natural frontier, which would become the source of much friction between the two nations in the years to come. Partly as an oversight, partly as a connivance, however, little action was made when Burgundians and Ostrogoths flowed into Italy marking the death of the Western Roman empire. Much more successful was the Byzantine counter-attack, which saw themselves relieved of any operation on the Western front thanks to Visigothic back-up. By focusing exclusively on the Near East, this allowed the Eastern Emperor to not to spread his troops too thin and have a full control over maritime movements. Giving up Hun-ravaged Italy except for Sicily the city of Ravenna, he shifted his priority on settling the accounts with Persians on the East (resulting in minimal territorial losses only in Mesopotamia) and the unorganized desert marauders which started rushing from the South since the 7th century (effectively stimying their advance to Egypt if at the cost of great resources). What could've been a chance for European culture to redeem itself after nearly 300 years of fierce warfare, however, turned into a long period of stagnation. While the geographical position of the Hiberian peninsula would've made Visigothia privileged in seafaring exploration, the inherent weakness of the government quickly brought the central power to collapse into a myriad of successor states only interested in vying among themselves for internal dominance, often taking the latest heresy of Christianity as a pretext to wage war against each others. In Francia, still stuck in its tribalist ways due to an almost nul contact with the post-Roman Europe, the long period of "do-nothing kings" effectively reduced the role of monarchs from military leaders and cultural patrons down to mere overseers of people's affairs, or at worst parasites, growingly paranoic of any possible assassination plotted against them. Worth noting is the mention on the annals of a so-called Peppin's Plot circa 750, which resulted in the execution of the king's master of palace and a more authoritarian management of the court. The Byzantine Empire, undergoing a deep shift toward Christian thinking that obfuscated much of the Classical culture, had to fight a solitary war against the tribes causing disturbance in Italy and the Balkans and making the Mediterranean unnavigable with their unrestricted piracy, preventing them from minding about outward relations. It comes as no surprise that, until their fall to foreign colonization in 14th century, due to a lack of stimuli no notable cultural works stood out from the continent. Meanwhile, on the other side of the Eurasian continent, an opposite revolution happened. From the 8th century, the Kambujian empire in South East Asia grew in wealth and influence. Stirred by the pressure of its powerful neighbours, at first the Khmer kings sought an economic expansion policy, turning their mainly agricultural state in a maritime and trading power. Suryavarman II's successful military campaigns had secured Khmer the southern tip of the Malay peninsula, granting them a springboard to the Indochinese sea and giving an opportunity to monopolize on all trade routes in Indonesia. The many fractious kingdoms of the archipelago saw no choice but form a loose confederacy dependant on Khmer's commercial power and influence, only to be absorbed into the empire proper a century later. Having mastered knowledge of the westward currents in the Southern Emisphere, Khmer sailors grew more daring with their explorations. The swift equatorial winds of the Indian Ocean sped up travels considerabily and allowed them to cross the full length of the sea in significantly less time than normal. Since the first travels, these seafaring skills quickly brought them to found several small semi-permanent settlements in East Africa and the island of Madagascar by the end of the century, beating the Arab colonizers, who took a couple centuries more to band together and trudge down the coast. By 1250 AD, as the population of Kambujia grew for the first time into the 9 million, Khmer's maritime empire boasted outposts all over the rim of the Indian Ocean, with a few tentative townships into the island of Greater Java ("Ribotes" to the Europeans). Although the king knew the true reasons as thoroughly as the sailors he ruled, the favourable currents that resulted in this ease of sailing were nonetheless used as a propaganda among general populace to prove indeed that the gods had destined him to rule the whole world as his full royal title alluded to. By a few decades later, Khmer ship smoothly crossed the Cape of Winds (the southernmost tip of the African continent), as per usual by taking advantage of the favourable westward currents. By 1280s, they tentatively made contact with the natives of Ghana, and by 1285 they already reached the Canaries. Suebian accounts of shipwrecked Khmer sailors making a call into the port of Lisipo date as early as 1290. But the real stage of Asian-European contact was yet to come. When the Khmer landed for the first time in Britain in 1310, they only expected to conduct basic business with the natives. The spectacle that greeted them was that of a derelict nation, whoefully stunted by centuries of infighting and isolation from the mainland continent due to a Frankish blockade, and almost begging for salvation from the constant harassment from the Northmen, who had long established a puppet state on the eastern half of the country. When the envoys returned to the court of Indravarman III some years later, they brought, along with bemused stories of local customs and fauna, also the proposal to bring the people of Britain under their protective wing. The proposal came just in time as a long period of truce was signed with the formerly hostile Vietnam, and a token fleet was dispatched without much hesitation, at first just for the purpose of policing the North Sea from any possible piracy from the Northmen, which could've disrupted the trade in the zone. Little did he know that this gesture would prove so valuable in future. The gratitude of the "freed" British was such that they basically threw themselves at the feet of their new "paladins" after the first successful naval skirmishes. Whoefully eye-hurting, aliased version can be found here. Viralworld and Archangel like this. Well, first post and it's in a MOTF thread. Ambitious much? Anyway, on to the actual map. The PoD is that Alfonso does not die in 1468. Instead, he takes control of Castile, something that hampers the unification of Aragon and Castile for a long, long time. While Columbus does sail, he doesn't sail for America. Rather, he actually sails Vasco da Gama's route. This leads John Cabot to discover Newfoundland, while Martin Pinzon discovers South America. The initial lack of knowledge leads to North America to be called Cabotesia, while South America becomes known as Pinzonia. The main languages of this TL's Americas are Spanish, English, Dutch, Swedish and Arabic. in 1690, king Alfonso XV dies, leading to a succession crisis between Aragon and France. The sides slowly draw themselves up, and what begins is the War of Castilian Succession, a 12-year conflict between various European powers. Unfortunately for France, as Aragon advances deeper into French territory, supported by Dutch and Piedmontese allies, the populace of Southern France becomes increasingly disillusioned with the French government, and the independent Kingdom of Aquitaine is proclaimed in 1700. At the same time, 1702 sees the continued independence of Provence and the unison of Aragon and Castile as the United Kingdoms of Iberia. Despite de jure unity, Iberia is still a heavily factionalized area, something that does not improve when Portugal is added into the nation. This, in essence, allows the Barbary states to flourish, and here is finally where Arabic America comes in. Vast amounts of traders from the Hafsids, Moroccans, and Tlemcens come to the coast of Cabotesia, leading to such prestigious port towns as Mooreburgh in the Newfoundlander Territories. This starts to increasingly strain the relation with the Ottomans, who are pushed out of Africa in 1750. Republicanism first comes to the continent in 1780, when disillusioned Frisians overthrow their government. Known as Sciringists after the Schieringers that fought in the area so long ago, the Republic of Frisia proceeds to invade some of its southern neighbors in Hainaut and Brabant. This causes what is known as the Great European War (1788-1800). As the War drags on, more and more countries in Europe fall to Sciringism, such as Aquitaine. However, Frisia is officially crushed at Bremen in 1800, especially as her leader, Pier Douwama, is killed by an errant Austrian bullet. The governments of the Barbary states are overthrown and replaced by Neo-Sciringist democracies. in 1900, the Second Great European War commences, this time aided by a specter coming straight out of France. This "revanchist" philosophy has been argued to have come at the very least 200 years too late, but that does not seem to bother the French. Fond of absolutism, Revanchists quickly take control of France, Austria, and Russia, and soon, a new war is happening again. In 1905, the War comes to Africa and the Middle East, as France announces its intent to reclaim Jerusalem. The Ottoman Empire, weakened, finds itself unable to deal with this alone, so they form the Rum Pact. Most Muslim nations join the fight, but is it enough to stop the French? Although the Revanchist powers are defeated, the Levant demands independence from the Ottomans. by 1920, the entire Ottoman Empire is reduced to territory around the Straits and Smyrna - and it loses even that in a war against the Greeks. What is left declares itself independent of the Ottoman Sultan, and declares the Republic of Turkey. Although things look good for a while, by 1935, Revanchists will be back in France, and have also taken control of Astlan, the ex-Swedish colony in Central America. What follows is, surprisingly enough, not a new world war, but rather a series of localized conflicts against the Spanish, Vlandrians* and the Republic of Germania, which end abruptly in 1950 with the overthrowing of the last Revanchist armies. Now, with the world seemingly descending into an era of peace, a cold war starts between the Neo-Sciringists, headed by the Germanians and loose Arabic alliance that came out of GEWII, and the Monarchists, headed by the Vlandrians. But wait, where's the colonies in Europe come in? As it happens, quite some weird stuff has butterflied into existence. The political stability of Europe is roughly on the level of OTL's Middle East today, with constant threats of terrorism and especially coups. Now, if you recall the fragile UK of Iberia, yeah. Portugal left many years ago, in 1910, but now the country is at breaking point. Increasing demands for the expulsion of any and all foreigners in the nation causes a complete collapse in the area. This, coupled with civil war in the Hellenic area, alarms the other Mediterranean powers - Barbaria, Morocco, Algiers, Turkey, and the Republic of the Levant. with Moroccan citizens' lives on the line in Iberia, the Castilan government accepts a intervention force in Southern Iberia in 1965, leading to Moroccan iberia, or Gharnāṭah. Meanwhile, Turkey moves to restore order in its Hellenic neighbor, more specifically in the Marmara area. as Barbarians land in Valencia to help the Aragonese government keep everything under control, the final straw breaks the camel's back. Almost overnight, the UKI is dissolved, and various successor states arrive to take over the show. In addition, Naples and Sardinia are brought under Barbarian Control, the Levantine influence in Arabia expands, Portugal now pays lip service to the Moroccans through the use of advisors, and Northern Italy is under a firm and watchful Algerian eye. To consolidate their gains, AMBLT reforms into the Mediterranean League. This allows the AMBLT nations to have some control over other Balkan States as well. The peacekeeping planned by AMBLT enforced perhaps not the traditional sense of colonialism. Rather, it enforced a very modern type of colonialism, which is already being called "Mahgrebism" or "Ambletism" by detractors (the e standing for the Earth's disgracefully swift acceptance of events). In 1997, the Vlandrians decided to teach this new War in their curriculum, and asked the printers Smidt & Blaauwheimer to make this map, supposed to be a quick overview of the events. Vlandrian anti-Sciringist propaganda is subtle, yet there, with clever use of the words "Great Game" (emulating the Swedish-German fight over Eastern Europe) and "surrender". Deoric was awoken ere the sun had risen much above the roofs of Hamwyck by a great clamour. For a moment the nightmare that had haunted him accompanied him into the waking world; it’s the Grave,* he thought, the righteous called up to heaven, and I’ve been left here, here in this stinking hut. But he patted the wounds on his back and reassured himself that the One who had won the victory over death would not allow him to mortify himself in His name without reward. Ships, thought Deoric. No mere fishing expedition then, and it had been a long time since the navy of the Anglish king could command more than scorn. “The Franks!” Deoric had been a child no higher than his father’s waist when last the great old beast across the Channel had sought to impose its authority upon these islands. The Emperor claimed all Bryttain, at least on behalf of his cousin, who, if he had his way, would turf every good Anglishman into the sea in the name of long-dead Cadwallader! He seized his bow and mail from the corner of the shack, pausing to grab the little necklace that reminded him of Who else had suffered in this world, and staggered out into the dark blue light. His son stood on the dock amongst a crowd of thirty or forty men, some half-dressed in their mail, others still laced into their nightgowns. What were they waiting for, Deoric thought? Oswic turned, and his lip was quivering. “Look, father.” He stepped aside, and for a moment Deoric caught a glimpse of what was on the horizon. For a moment, it made no sense – a great brown strip had obliterated the place where sea and sky met, a great shimmering mass. Then he saw it – the sails, sails on sails, floating above the mass, and the mass resolved themselves into individual ships, each taller than any cathedral spire save St Offred’s in Lundun. His mind strained for anything comparable, and could only deliver this thought ‘This must be how Izekelas felt when he saw the keruvim and their wheels, so terribly high over the earth’. “There are not so many ships in all the Empire,” he said, numbly. “There are not so many ships in all the world,” said Alfredric the sadler, and Deoric had just enough of his wits about him to think that had just been proved patently untrue, but he said nothing. Now he could parse the shapes of the individual ships, he could see how close they were packed into the harbour – so close they were rocking each other with their wash. As they watched, a brace of smaller rowing boats approved, emissaries from that great fleet. Each end of the ship curved up to a point – the shape evoked something like a shiver in Deoric, an ancestral memory – the prow carved into something like the head of a cat. The men standing at the front of the boat held long dark clubs, cocked in an odd salute, and wore dark helmets that joined underneath their chin. As they grew closer, Deoric saw that they had long, dark hair worn in a queue. The one at the prow – presumably their leader for he wore a cloke and lacked one of the black clubs – called out to the crowd, but his voice seemed indistinct. Every so often there would be a word that seemed familiar, but then it would be gone, in the way of dreams. Deoric began to wonder if he was still asleep. “Is it Anglish?” said one. “No, raca, it’s Northumbrian,” said another. “Danish, it’s Danish,” said a third. It took until the sun was high for them to find a translator, a Noorwegian, who still had to ask and answer many, many times before he comprehended what was being said. “Perhaps they come to trade those hides,” said Alfredric, looking covetously at the perfect leather cuirasses the strangers wore. Deoric looked at the hard lines of the face of the man in the cloke – somewhat like the Noorwegian’s but the cheekbones were all wrong and the skin tanned, like a Mahometan’s, save for his blue eyes which took in the crowd, their dwellings and their meagre weapons. He thought – those aren’t the eyes of a man come to trade, but those of a man come to stay. At length the Noorwegian broke away from the strangers, and was grabbed into a huddle of the Anglishmen. The strangers were evidently tired of waiting – more of the curving boats had pulled up, the prows carved into demons and beasts unfamiliar to Deoric, and the men stepping off them were pushing into the town. The leader of the first boat drew past the huddle, beckoning the Noorwegian to follow. He looked at Deoric and tapped the little cross on his chest. Deoric defensively drew a hand over the charm. “Hvar en Anagyarr had vrailaik tellit!” A smile cracked his features. Deoric felt a sudden pang of relief. How wonderful, how healing to the breast, that a man could come from far across the ocean and yet meet his brother! The stranger’s countenance fell at once and became bitter. Turning his head from Deoric, he spat into the dirt, and said something the Noorwegian did not translate. Then he left, with about sixty of the strangers, in the direction of the church. Other than a worlda collaboration with Nicksplace27 ages ago, this is actually my first attempt at a MotF submission; hopefully the letter of the challenge ("countries from another region") has been honoured, if not exactly the spirit. I would not be surprised to find that the butterflied linguistic elements of this map are completely, offensively wrong; I will point out that until yesterday *Russia was called 'Great Moravia'. * False cognate: derives from ‘Grabben’ – what we would call the Rapture. Pronounced ‘grah-vuh’. TheKutKu, Viralworld, Swede and 1 other person like this. This was not one of the best, but I think I'll post it to show how far and fast the author has progressed in the last three years. The PoD is at the Fall of Rome, where Europe falls into an even worse Dark Age. The other PoD is the early growth of Teotihuacan into a major civilization. The Teotihuacan spread their ideals throughout next 1,000 years, and ended up discovering the Americas in 1350. Colonization immediately followed, with Africa and Europe being vassalized by the Mongols or the Americans. This is the world in the present say, starring a consolidated HRE, weak France, and an Iroquois Ireland. The Winnah was Sregan. Second place went to ThePicene (a disguised Epicene?) and third to rvbomally. I shall try to keep to updating this weekly. I plead not guilty due to holidays! Make a map showing a short-lived state or region in transition. There are no restrictions on when your PoD or map may be set. Fantasy, sci-fi, and future maps are allowed, but blatantly implausible (ASB) maps are not. You may show the world or part of it in a short-lived state. This includes short-lived countries (such as the CSA or the State of Hatay), short-lived governments (such as the British Protectorate under Cromwell), a country or region in the middle of war or revolution (such as Nazi-occupied Europe), a region in the middle of massive geopolitical changes (such as Russia during the Russian revolution, or Europe during the collapse of the USSR), and so forth. How short-lived the state or situation is may vary, but it should be short relative to the situations that exist before and after the transition. The inset on a German map of Africa in 1900, depicting the Cape states - in this case, the Dutch Cape Colony, the German colonies, the Portuguese, the British, and, of course, The Federal Huguenot Republic. This combination of three Huguenot Republics, Orange, Griqualand, and The Huguenot Republic. While the names are certainly bland, this shortlived federation of the Huguenot states was capable of defeating the Dutch for 10 years. However, the promise of gold in the Huguenot Republic was too great, and by 1910, the last Republics capitulated. In 1915, the Dutch would allow the Republiek Zuid-Afrika to become a member of the United Kingdom of the Netherlands, the Commonwealth equivalent in this TL. In August 1990, the Soviet Union collapsed into civil war after a semi-successful coup d'etat against General Secretary Mikhail Gorbachev succeeded. Gorbachev managed to flee from Crimea and take up arms in Stavropol with his supporters, while the Red Army and KGB managed, some how, to take command of the central state. In the intervening two years, the United States and the West have bankrolled Gorbachev's regime in the Russian Civil War -- but even then, the Ukrainian SSR was experiencing it's own civil war. Pro-Gorbachevist liberals seized most of Southern Ukraine as an independent Russian state, and are waging a war to the death with a group of Neo-Nazis who rule Western Ukraine with an iron fist of hatred and racism. By October 1992, the Red Army/KGB Soviet Union has occupied only a few areas in the former Soviet Union, while the rest of the country has either fallen to native revolts, the State Union, or whatever powers that be. Kyiv is under constant artillery fire by the Greater Free Territory, which aims to retake Kyiv, and reconquer Ukraine for their faction. In 1993, they would declare the People's Republic of Malorossiya, bringing to an end the rule of ethnic Ukrainians, and the rise of an independent, Russian-lead state. So my very first MOTF entry! By the end of the XVIIth century, the ideals of the Platonic Revival were not yet widespread to all the common citizens of Europe and the Brazilian Colonies although they were already dominating some intellectual circles. Preaching common property, pacifist lifestyle and proto-ecologism, Neo-Platonism was seen as a stark contrast to the rising, capitalistic Commercial Companies (principally the Spanish "Oriental Asian Corporation" and the "United Provinces Company"). 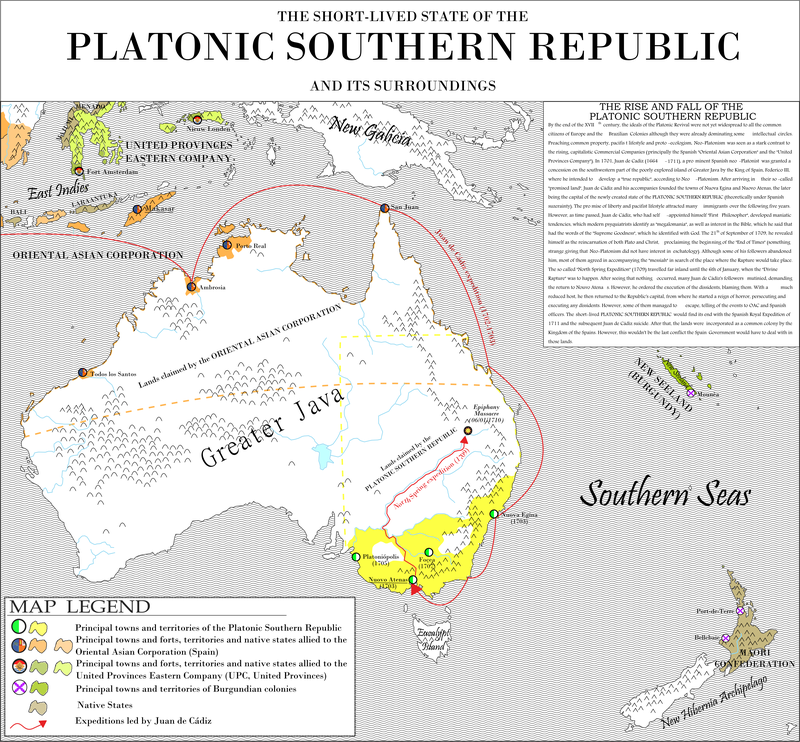 In 1701, Juan de Cadiz (1664-1711), a prominent Spanish neo-Platonist was granted a concession on the southwestern part of the poorly explored island of Greater Java by the King of Spain, Federico III, where he intended to develop a "true republic", according to Neo-Platonism. After arriving in their so-called "promised land", Juan de Cádiz and his accompanies founded the towns of Nuova Egina and Nuovo Atenas, the later being the capital of the newly created state of the PLATONIC SOUTHERN REPUBLIC (theoretically under Spanish suzerainty). The promise of liberty and pacifist lifestyle attracted many immigrants over the following five years. However, as time passed, Juan de Cádiz, who had self-appointed himself "First Philosopher", developed maniatic tendencies, which modern psyquiatrists identify as "megalomania", as well as interest in the Bible, which he said that had the words of the "Supreme Goodness", which he identified with God. The 21th of September of 1709, he revealed himself as the reincarnation of both Plato and Christ, proclaiming the beginning of the "End of Times" (something strange giving that Neo-Platonism did not have interest in eschatology). Although some of his followers abandoned him, most of them agreed in accompanying the "messiah" in search of the place where the Rapture would take place. The so called "North Spring Expedition" (1709) travelled far inland until the 6th of January, when the "Divine Rapture" was to happen. After seeing that nothing occurred, many Juan de Cádiz's followers mutinied, demanding the return to Nouvo Atenas. However, he ordered the execution of the dissidents, blaming them. With a much reduced host, he then returned to the Republic's capital, from where he started a reign of horror, persecuting and executing any dissidents. However, some of them managed to escape, telling of the events to OAC and Spanish officers. The short-lived PLATONIC SOUTHERN REPUBLIC would find its end with the Spanish Royal Expedition of 1711 and the subsequent Juan de Cádiz suicide. After that, the lands were incorporated as a common colony by the Kingdom of the Spains. However, this wouldn't be the last conflict the Spain Government would have to deal with in those lands. Vendaval, ETGalaxy, Charger24 and 2 others like this. The long and bitter battle raging along the eastern front is taking longer than expected and as the tide finally turns in the Soviet favour, the Allies have already captured Prague and Vienna, Berlin is under siege from all sides with the noose drawing tighter, and they are marching on Warsaw! A herculean effort is made on the Soviet side and the troops rush forward to meet the Allies. Though heavy resistance is met in the Baltic thanks to the fierce patriotic local SS units, they have more success in the south. Both sides finally meet roughly along the old Soviet border. The Allies made good progress through Poland and up into the Baltics. Here they met advancing lines of the Soviet forces and crushed the final battalions of the Latvian SS units in Courland. The Soviets on the other hand reach the Carpathians a little while before the Allies manage to march across the Panonian basin and all of Ukraine and Bessarabia are secured. And the Czechoslovaks? They can forget about Ruthenia! The Lithuanian monarchy is soon re-established. Unfortunately the king Mindaugas III (born as Wilhelm and son of Wilhelm [Mindaugas II.] who aquired the Lithuanian throne after the Great War) suffered a stroke while in exile in London and with no male heirs, his first-born daughter is crowned Queen Karolina I. Urach-Württemberg. Tough peace debates ensue and another conflict begins to brew. The Polish government automatically assumes that their former lands in the east will be returned to them. However the aforementioned former lands are not so keen to do so. After experiencing a kind of freedom at the German hands, they feel they are now between a rock an a hard place, aka Poland and the USSR. A middle solution is soon found. Lithuania, much to the Poles incredible fury, humbly steps forward and is willing to take in the Belarussian rump-state. Soon all is arranged and Belarus is united with Lithuania, with the Poles spitting bloody murder across the border. But all is not well in paradise. Soon pan-Belarussian resistance movements and politicians begin springing up, calling for a union with their brethren in the USSR. The pressure mounts at an exponential speed. Almost as if there was someone behind it. The Allies are forced to step in and a plebiscite is held. After a VERY close result, it is decided to secede the territory to the Belorussian Soviet Socialist Republic. After just eight years, the Union is dissolved. A mass exodus of Belorussians follows to Poland and, now separate, Lithuania. As a new homeland for this great Belarussian diaspora is being searched for, many free-thinkers look towards East Prussia as an alternative homeland for these expats. Charger24, Archangel and Viralworld like this. The legendary riches, as represented by a bunch of dirt poor Norwegian Greenlanders. The 2nd American Civil war began after the American Socialist Unity Party lost the 1932 presidential elections in a corrupt bargain. Despite winning a majority of the popular votes it failed to gain a majority in the Electoral College. Nevertheless it still had a plurality of votes and it would be reasonable to expect them involved in government. A series of backroom deals resulted in a unified "American Patriotic Union" forming out of every single other opposition party, and (still with a minority of the popular votes) gaining the majority in the electoral college and winning the presidency. The use of administrative powers and the bypassing (the majority Socialist) congress resulted in the ASUP calling for a revolution (and many answering the call) On February 17th 1937. The ASUP would radicalize throughout the war and would purge itself of every non-orthodox Syndicalist from its ranks. As it became more and more extreme it lost more and more support, but the various fractures within the "White" movement including the Pacifican States of America, the American Commonwealth, the Holy Convocation of Deseret, New England, and the Republic of Texas with several coups added for good measure would ensure that, by the time the White movement reunited after the disastrous battles of Pittsburgh and Philadelphia, the Reds would win the American Civil War. Unlike OTL, Britain wasn't invaded by Angles and Saxons or any other Germanic groups, but due to a very, very different migration period along with some drastically different developments during the final decades of the Western Roman Empire, a number of Slavic tribes came to populate the British Isles, and much like the Anglo-Saxons of OTL, their language and culture came to dominate the land. Their language is close to, but distinct from, what we now know as the Western Slavic languages. They came to the known as the Belakreg, after their own name for the island of Britain. The Belakreg were always divided amongst themselves into generally four different kingdoms, and were constantly in conflict with the Welsh and Cornish to their west, and the Picts to their north. Such conflict was amplified due to the religious differences, the Belakreg being mostly Arian Christian, compared to the Catholic Celts. The Belakreg were never united until the period which historians generally called the Plaverodite Hegemony. The period of the Plaverodite Hegemony came under the reign of Ogniyen the Old, who succeeded in uniting all four kingdoms after a tumultuous period of civil war and internecine conflict within the other three kingdoms. In that period, the Welsh March (Nemetski Krai) and the Pictish March (Piktski Krai) were exceedingly violent and prone to raids. Ogniyen's campaign to conquer and unite all the four kingdoms took most of his life, but the effects of that were felt long after him. The marches were pacified and inter-religious conflict was also quelled. In his last decade of rule, Ogniyen declared that all the kingdoms be united under the new title of High Kingdom of Belakreg, and declared himself High King. This new political arrangement lasted for little over a decade, for after Ogniyen's death, his successors scrambled over control of the four kingdoms, and the High Kingdom broke apart, but Ogniyen's legacy persisted, as his successors devoted their reigns to recreating the High Kingdom, and uniting all the Belakreg yet again under one banner. This is my first MoTF entry. Since the UK in this timeline has more troops, resources, etc. than the OTL United Kingdom, they were able to hold onto Iceland until the end of the war. On 9 April 1940, Denmark was invaded by Nazi Germany. The Faroe Islands were occupied by the UK on 12 April 1940, while Iceland was invaded 28 days later. Greenland, however, remained neutral and was defended by American forces for the rest of the war. While the British defended it for most of the war, American troops were deployed to Iceland & the Faroe Islands in small numbers following the transfer of some of the territory's defence to the US on 7 June 1941. Three years later, the British territory of Iceland & the Faroes held an independence referendum to decide whether the union with Denmark should be abolished or should continue, and independence was declared on 26 June. British troops remained in the islands for a couple of years to support the growing Icelandic Coast Guard. The republic is still heavily influenced by the war years & British occupation, & many reminders still remain. Charger24 and Archangel like this. Basically, after the Gulf War, with World Concordiat Troops withdraw, and leave Sebastian Hughes in charge of Mississippi. The blacks and Appalachians finally see their chance to leave Mississippi, so they rise up in early April 1991. Both rebel groups are doing very well, and appear to be winning as the summer starts. Mississippian offensives manage to push them back, and both groups are destroyed by the end of the year. Though their nations are gone, their causes are not. EDIT: The Flag of the Appalachian Separatists was created by Iserlohn. Make a map showing the aftermath of a war in which one side was forced into unconditional surrender. The winner shall be decided by a simple poll with a simple question: Whose map is best? Some people call it the third world war but most analysts agree that the only war happened in Europe and the rest were minor skirmishes. However it is undeniable that they are all linked. When the Russian block clashed with NATO, many wished for a conflict in their own country or region took the chance when the powers were distracted. One such minor skirmish happened as the Russians made a breakthrough in the Dardanelles. Morocco saw its chance and finally seized control of the long-contested Plazas de soberanía in the north, including Ceuta and Mellila. And they might have gotten away with it if it wasn't for those damn Americans and their dumb ships! (cookie to the one who gets the reference). The taskforce which had been sent to push back the Russians in the Mediterranean received news of these two African outposts being overrun just as they were entering the gulf of Cadiz. Fearing that Morocco may have decided to side with Russia and attempt to seal off Gibraltar straits, giving the Russians time to establish holdings in the Agaean sea and possibly as far as Crete, an amphibious landing was executed in Tangiers, Telouan and Ceuta. With the straits secure, the teskforce moved to stop the Black Sea fleet from moving forward. As the war wound to an end, NATO turned their eyes south at where the Moroccans were desperately trying to push out the better trained and equipped American troops. Spanish troops returning home soon followed up with landings all along the northern coast and a coordinated strike in the south with the SADR. Very soon the combined troops were pushing towards Rabat in the north and crossing the Western Sahara - Morocco border in the south. The Moroccan troops crumbling under the assault and almost constantly retreating, the king was forced to sue for peace. The allies saw that they couldn't have an unpredictable country with an aggressive past holding the straits. So a decision was made to split it along ethnic lines into three countries friendly towards the NATO to keep a watch on the Moroccan rump state. The High Atlas Berber Federation - A joint state of three ethno-linguistic Berber groups along with two areas of mixed Arab-Berber populations in a quintuple federation. The Sahrawi Arab Democratic Republic - The rest of Western Sahara was delivered into their hands but the politicians to lead it are western-picked before they are presented to the public for elections as the West is fearful of an attempt to seize power in this state flooded in weapons. and finally, The Kingdom of Morocco - the state was handed to the son of the old Moroccan king, the eighteen-year old Moulay Hassan I. along with several NATO military bases and a whole army of European "advisers". 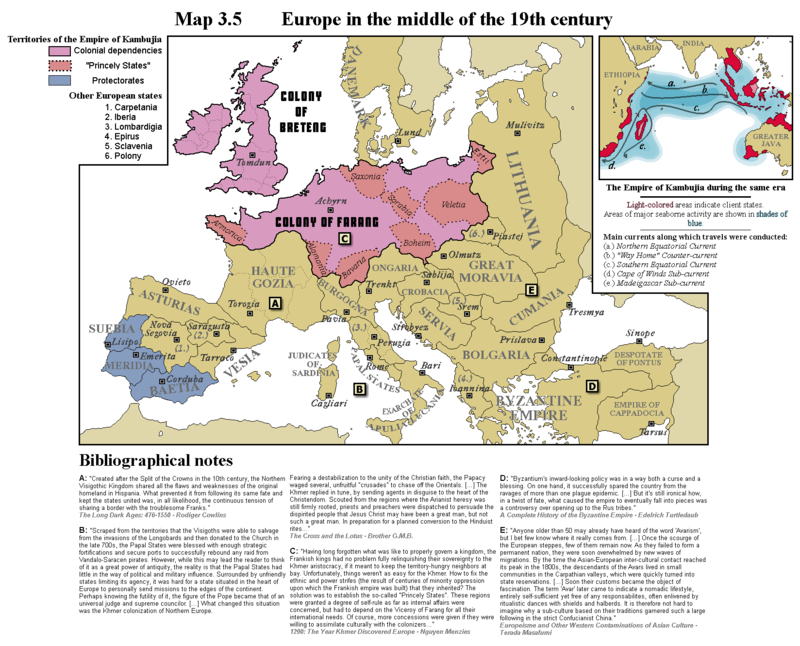 Burgundy, Bavaria or the Christian Union of German Republics (C.U.G.R. ), whose citizens and governments held many interests in the U.P.C. handed to the government as, a week later and backed by England, France, Bavaria, Burgundy and the C.U.R.G., it would declare war against it. deprived from most of its fleet, it was not able to be a significant threat to its neighboring enemies, limiting to occasional raids and to defense itself. fled to the relatively safer countryside, it is calculated that around 300.000 civilians died during the last weeks of the war. former metropolis until several weeks before the Peace of Calais, in which they also participated. 1. The United Provinces government recognized being guilty of causing the war and the destruction it produced. 2. The United Provinces government recognized the United Provinces Company and would compensate the material damages it caused it during the war. 3. In India, the forts of Hasira, Goa and the territory known as Tamil, and in Africa, the fort of Gouden Kaap, were handed to Spain. 4. In Indonesia, the fort of Pulau, and in Africa, the fort of Jamesport, were handed to England. 5. In India, the fort of Rajapalonj was handed to Burgundy. 6. In Northern Brazil, the western part of the island of Kisqueya was handed to the Christian Union of German Republics. 7. In Africa, the island of New Frisia was handed to the United Brazilian Communes. 10. The United Provinces Company was given the exclusive right in the United Provinces of trading with the colonies. 11. England, France, Burgundy, the C.U.G.R. and Bavaria were exempted from paying transit fees in the Saint James River for 15 years. Republic of Meppen and County of Oldenburg) suffered the same fate. 13. England annexed the Republic of Sothern Mercia and the Republic of East Anglia, as well as the western half of the Republic of Sussex. Republic of Rheinberg (associated state of the United Provinces). access to the North Sea. 16. Bavaria received the small territories of Moerdijk and Goree, guarantying access to the Atlantic Ocean via the Rhine River. 17. The City of Calais, now in corporate hands, was made the Headquarters of the United Provinces Company. the former republics. The United Provinces Company would be able to elect 25 representatives from the 110 that constituted the chamber. 19. The United Provinces Company would have power of veto over economic and diplomatic decisions coming from the Supreme Court. 20. All of the shares formerly in United Province’s government hands would be auctioned publicly, as well as many public buildings and properties. parts, both colonial (now under full U.P.C. control) and metropolitan, were retained.